My cut flower patch is such an important part of my allotment. Last year was my first year and my ideas about using some of my plot for flowers were greeted with some scepticism by the established allotment growers who couldn’t understand why I’d wasted so much of the plot on putting in paths, let alone devoting soil to growing flowers instead of potatoes and onions. However, it seems like the flower bug is catching and I won’t be the only one this year with blooms brightening up the site. A couple of the older growers were asking me where I bought my seed from, so I passed around a few seed catalogues and dished out some packets of seed I had collected last autumn. Then on a visit at the weekend I was chatting to two of them and they were telling me all about their plans for cut flowers!! Not such a strange idea after all. My own patch is taking shape with the biennials and autumn sown annuals coming into their own. 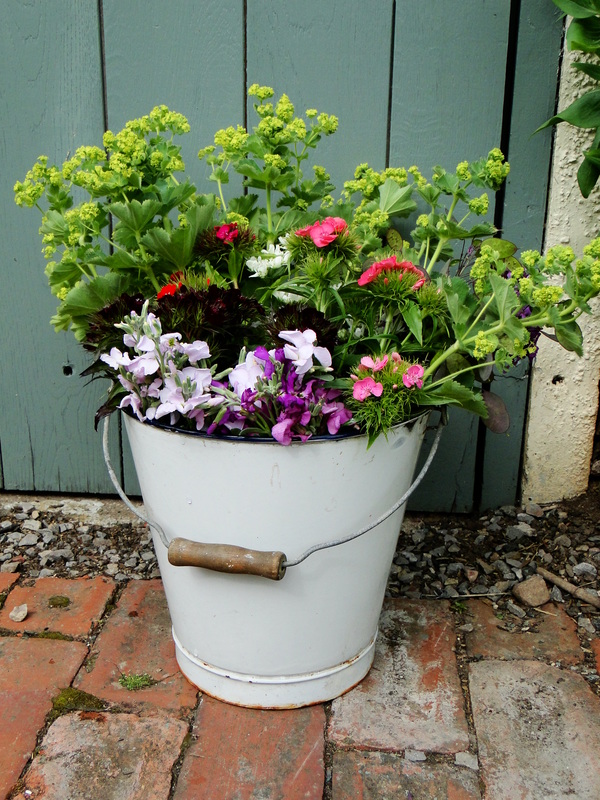 The much-anticipated flowering of the sweet williams has just started in the last week and I’ve been able to fill a good 2 buckets full of sweet rocket, honesty, alchemilla, orlaya and the last of the stocks. Yesterday I got up to the plot early in the hope I could get a lot done before it got so hot that I started to wilt. I had to make two trips with the wheelbarrow, transporting little plants from home to the plot so that the first big plant out could commence. In went some annual asters, daucus ‘Black Knight’, white antirrhinums, didiscus, some pinks grown from cuttings taken in March and some bupleurum. 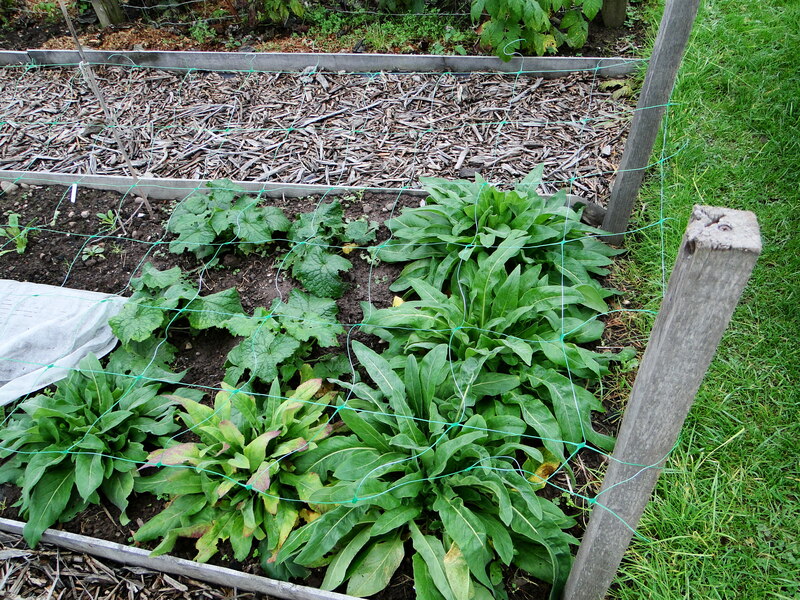 There were also some small plants of lettuce, beetroot and chard for the edible part of the plot. Still at home and waiting for the second round of planting out are zinnias, rudbeckias, cosmos, sunflowers, cornflowers, gaura, dill, gypsophila and a few more larkspur. Oh, and two dahlias. It’ll be touch and go as to whether I can fit all this in. There was quite a lot of standing around with hands on hips looking thoughtful, on Sunday, wondering whether I’d had the garden equivalent of piling my plate too high at a buffet because my eyes were bigger than my stomach. My imagination is certainly bigger than any available land I have but I’m sure with a bit of jiggling around I can do it. That’s squeezing plants in and not me doing some strange dance, by the way. The great thing about gardening is that each year is different and new opportunities open up. I’m still very much learning just how much I can cram into a small space and for how long I can get the season to last. Plans are already being formulated for which biennials to sow later next month and which hardy annuals I’ll sow this autumn. 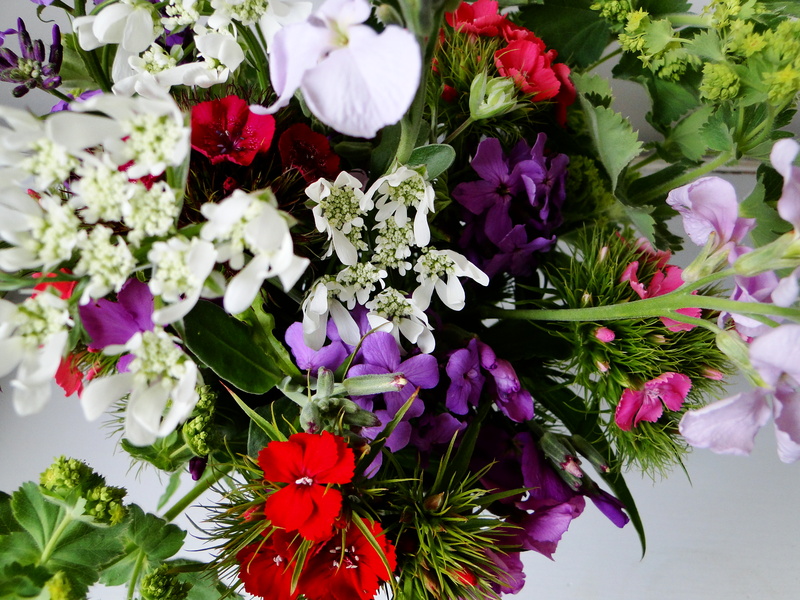 But, for the moment, I’m enjoying this year’s first pickings from my cut flower patch. I posted the other day about the successes and failures on my cut flower patch this year. In this post I thought I’d share with you my plans for next year. I’m getting excited already!! 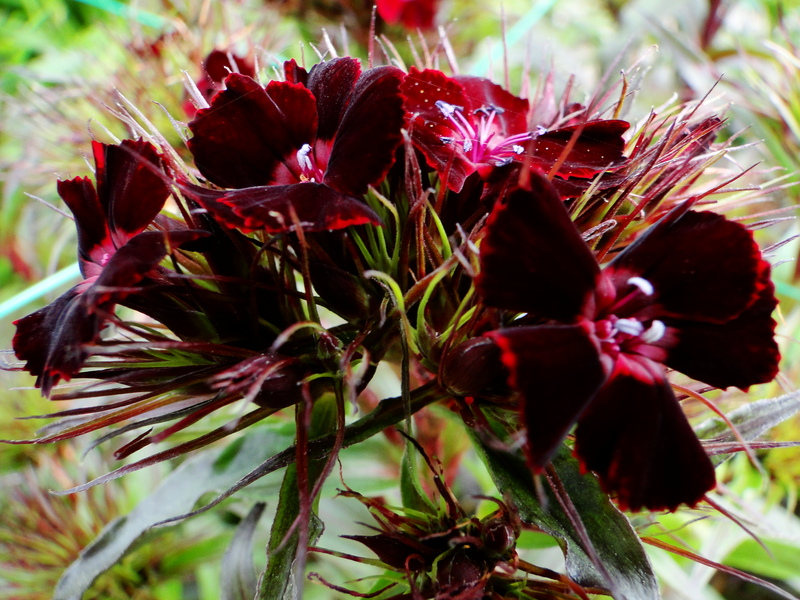 Back in July I sowed some Sweet Williams, Sweet Rocket and some Honesty. These are all biennials, so you sow one year, they put on some growth and then the following year they flower. I love biennials, you can sow them between July and September, at an otherwise quiet time of the year. You then plant them up where you want them to grow next year and then they sit there through the autumn and winter tantalising you to the prospect of what is to come. If you’ve never grown biennials before and you’re worried about the state they’re in after the winter, don’t. Mine looked pretty sorry for themselves after last winters snow and minus 16 degrees C but they soon perked up when spring came. I’ve also planted some bulbs, some Anemone coronaria and some Gladiolus colvillei ‘The Bride’. This year I definitely lacked enough filler flowers and foliage so my plan for next year is to improve this. I found Alchemilla mollis to be a brilliant filler. It’s lime green flowers contrasted beautifully with so many other flowers and it lasted well once cut. An added bonus is that it self seeds very freely so I am moving little plants that have self sown in the garden up to the allotment and I am edging all around one of the beds with Alchemilla. In the centre will be the early flowering Gladioli and once these finish flowering I will have some later flowering plants waiting in pots to go in. 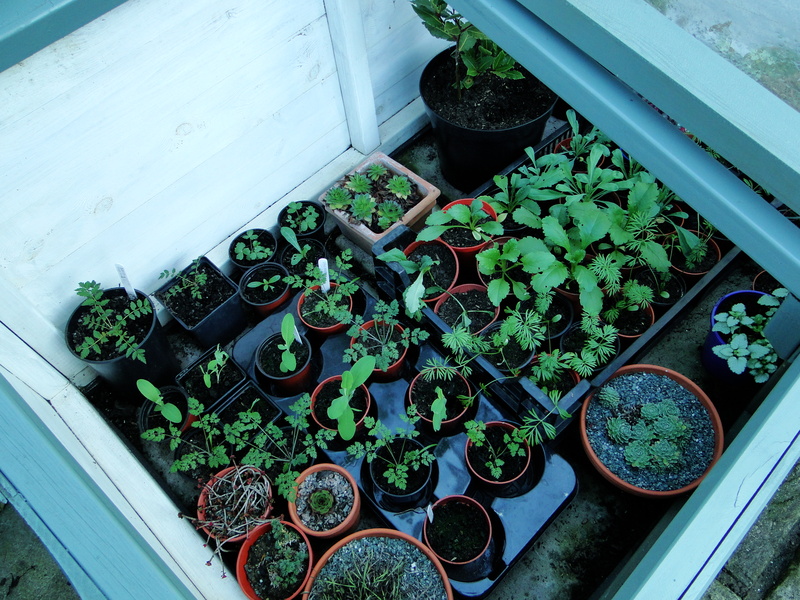 I have sitting in my cold frame a whole array of hardy annuals that I sowed back in September in the hope I will be able to get an early supply of flowers. 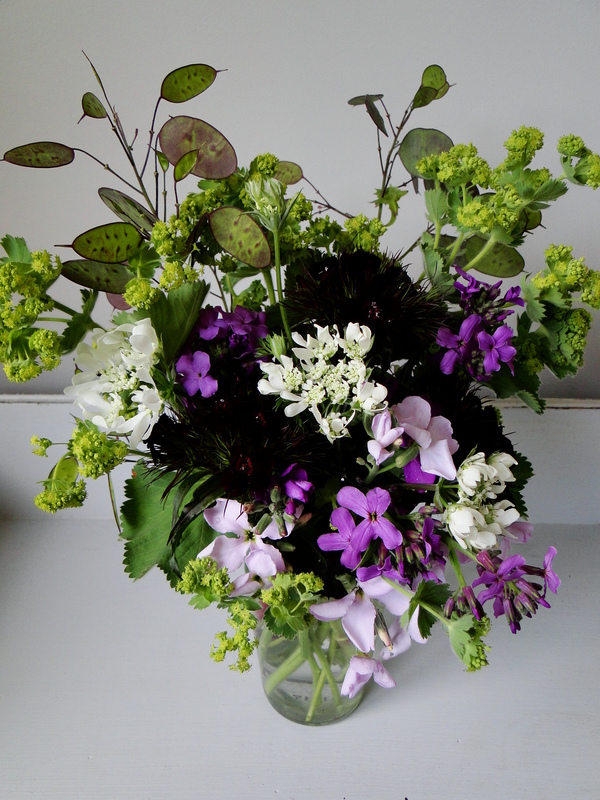 These include Scabious, Nigella, Orlaya and Bupleurum. Although the mild autumn has meant they have put on more growth than I would have liked. I just hope they don’t succumb to botrytis. But there’s nothing really lost if they don’t make it, I’ll just sow another batch in March and have slightly later flowers. My main aim is to make the space work as efficiently as possible. Any flowers really have to earn their place, which means they produce over a long period of time and have a good vase life. So with this in mind I won’t be growing any Calendula or Dahlias at the allotment. I love both but they just don’t last very long when cut. I’m sure I’ll be able to find a spot for them in my garden though. I’m trying some Larkspur next year and some annual Asters. The Zinnias I grew this year just flowered and flowered but it was a mix and some of the colours were difficult to use with other flowers so I think I will go for single mixes next year, there are some particularly beautiful colours in the Plants of Distinction seed catalogue along with a great choice of Antirrhinums. 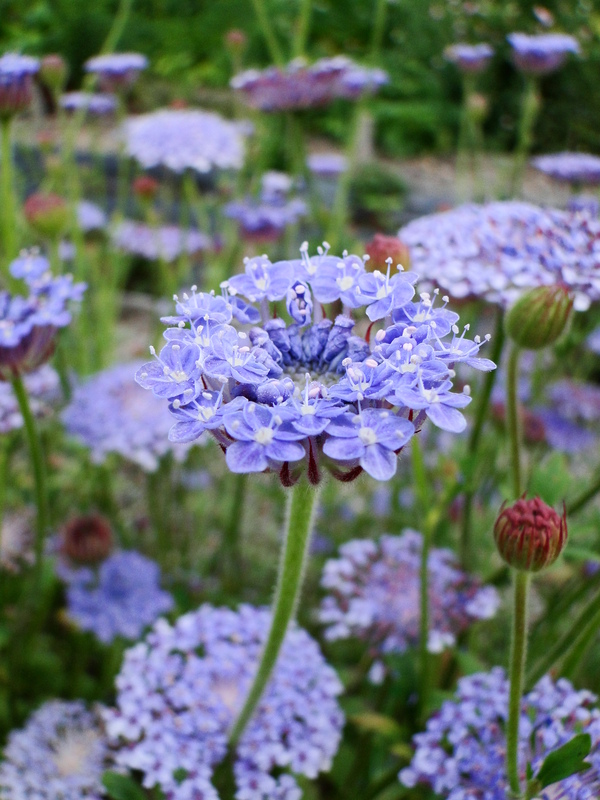 I will definitely be growing Didiscus ‘Blue Lace’ again, it took a while to get going but was so unusual. And of course there will be Sweet peas. There vase life is not great but they produce so many flowers over such a long period and their scent is so amazing that they are a must. I had 3 teepees this year which was a good amount. There was a period when I had so many I couldn’t pick them fast enough and I was having to give them away at the allotment but nobody complained. I will also be extending my bean netting support system to a third bed. 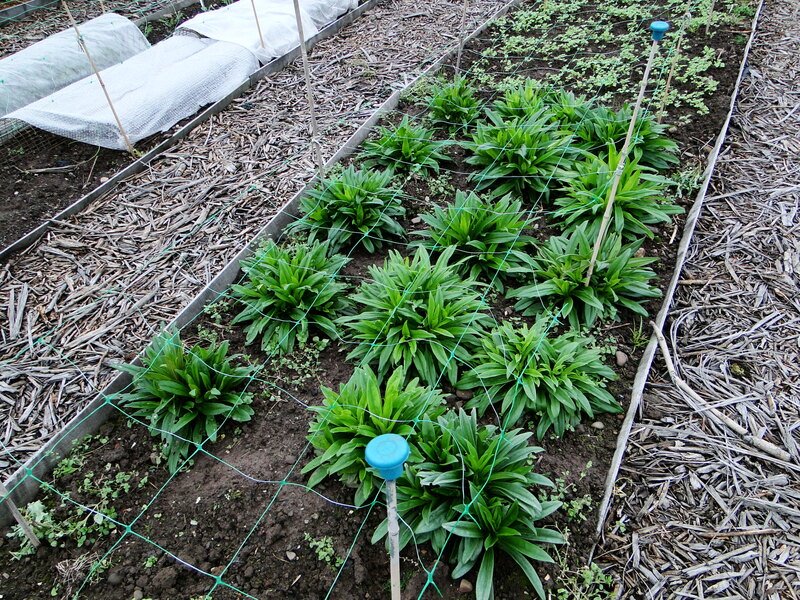 I only used it on 2 beds partly because of expense and partly because I thought the other plants (rudbeckias) would be strong enough to support themselves. And for most of the season they were but then we had quite a stormy patch at the start of September and the rain and heavy winds meant the plants flopped over and some stems broke. It’s always hard to resurrect plants after this has happened. Some I’m just going to bite the bullet and net the third bed. Growing cut flowers this year gave me so much pleasure. I can’t wait to see what I can do next year. If anyone has any suggestions for great cut flowers let me know. The weather has been quite miserable and there is a real feel that autumn is here. I have that awful feeling that the descent into winter brings; the long dark nights, days that don’t feel much lighter and being couped up inside. Winter is not a good time for someone who thrives on being outdoors. It feels too soon, I should feel like this in October not at the beginning of September. I’m still hoping for an ‘Indian Summer’ like last year. When I feel melancholic like this the best thing to do is to get up to the allotment and do something productive. So today I spent the morning bagging up some green waste to go off to council recycling. I have got several compost piles but they don’t heat up enough, so anything diseased or perennial weeds is left for the council to deal with. I’m producing so much waste to go on the compost piles I don’t know where to put it all. I suppose if you mainly grow produce to eat, this doesn’t happen but half of my plot has been devoted to cutflowers and they’re generating quite a lot of waste now they are going over. I also mulched with some ready to use compost around my biennial flowers – sweet williams, stocks, honesty and sweet rocket. I think these biennials are brilliant: you sow them in July when its quite a quiet time for the gardener, plant them up in September as space is becoming free and then they sit there over overwinter, giving you hope for the spring to come and then from the end of April you are rewarded with some beautiful, sweet smelling flowers. The mulching task was made harder by the flat tyre on my wheelbarrow which became like the toddler who refuses to move, a good deal of pushing and dragging meant I got the compost to its destination but I think Wellyman will have to sort out said tyre at the weekend. The weather hadn’t improved when I had finished but allotment-therapy meant I felt much better.